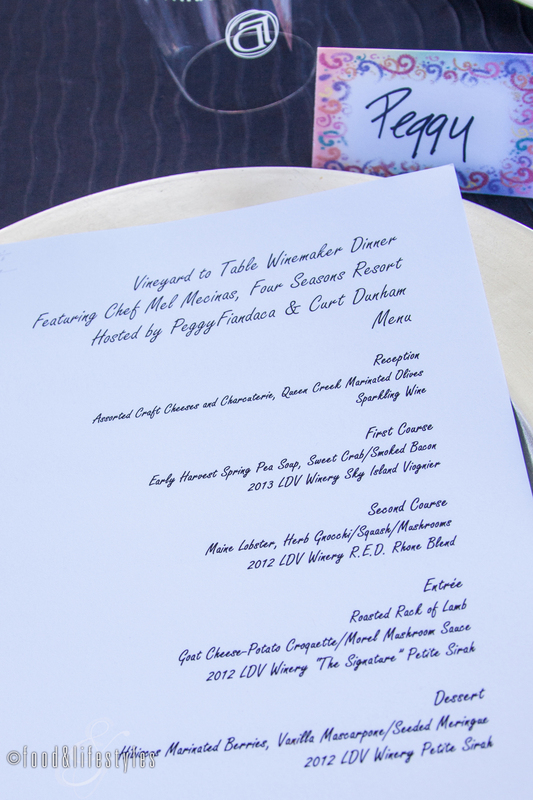 This month, LDV Winery launched their inaugural Vineyard to Table Winemaker Dinner series with guest Executive Chef Mel Mecinas of the Four Seasons Scottsdale. 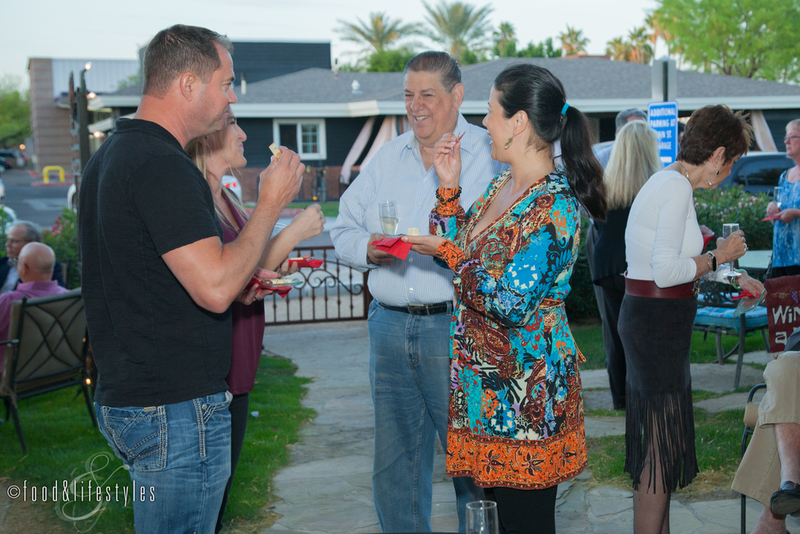 Hosted by Peggy Fiandaca and Curt Dunham of Lawrence Dunham Vineyards, the setting was the idyllic patio at the LDV Wine Gallery in Scottsdale. 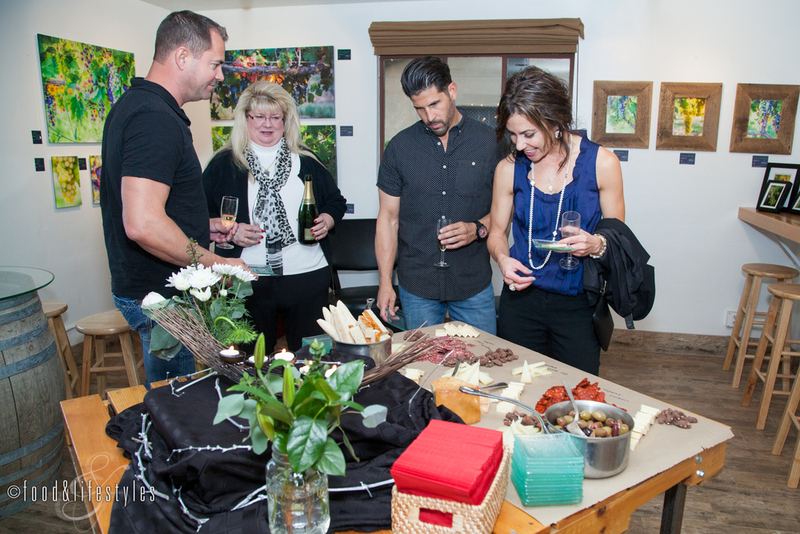 Our evening began with a selection of cheese and charcuterie, marinated Queen Creek olives, bread, and candied pecans as we sipped sparkling wine during the welcome reception. We were then seated at a beautifully decorated table for 20 to enjoy an al fresco meal as Curt Dunham spoke about LDV Winery. He tells us that this vineyard is situated at 5,000 feet in the Chiricahua Mountains of southeastern Arizona. Its location on rich volcanic soil along with the unique climate gives this wine its distinctive quality. "It can be 95 degrees at 11 in the morning, 65 at 2 in the afternoon, 80 at sunset, and 55 in the morning because of the weather coming off of the mountains," Curt tells us. "This thickens the skins and gives all the flavors and colors in our wine. It's why we get such robust characteristics off such young vines. We’re excited by what they’re going to bring us when they really get down into our soils." We also learn that LDV wines are "mostly varietal wine, which means each wine is 75% or more of one dominant grape. " Curt explains that this is for a couple of reasons: "I enjoy tasting varietals from all over the world, and also we’re trying to figure out what grapes are really the best fit for our terroir and with blending you can really never get that picture." Course two brought herb gnocchi tumbled with sweet morsels of Maine lobster, baby pattypan squash and mushrooms in a delicate and flavorful broth. Curt is a big Pinot Noir fan (Mendocino Pinots are his personal favorite), and he tells us about the pairing of 2012 R.E.D. "This is my attempt at making a pinot noir-esque wine out of Rhone varietal grapes. It's a blend of 62% Grenache, 8% Sirah, and 30% Petite Sirah aged in new French oak." As we sip and savor, he says, “I hope you pick up some of the dark cherries that a Pinot Noir would have, and there’s a little bit of smokiness to it from the barrel." Our main course is juicy roasted rack of lamb draped in an earthy morel mushroom sauce served with buttery leeks and a crispy-creamy goat cheese and potato croquette. Paired with this dish is LDV's signature wine, the 2012 "The Signature" Petite Sirah. "It's 100% Petite Sirah aged in new American oak for 33 months, so it’s a big wine that’s tannic, but with soft tannins, " Curt tells us. He also explains why this wine is so wonderful with our entree. "It has the tannin and the oak structure to hold up to that rich mushroom sauce and the rich lamb." Chef Mel brings out his team including Executive Pastry Chef Lance Whipple as he tell us they've worked together for seven years. 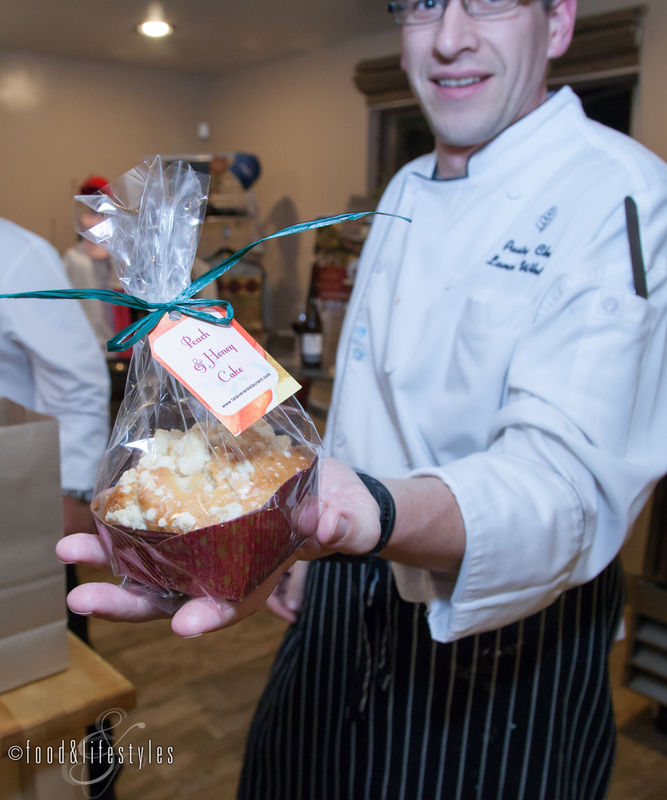 Talented and gregarious chef Mel enjoys these special events. "This is what we do," says Chef Mel, "let’s just go out and have some fun." Our sweet finale is an airy vanilla bean mascarpone with berries marinated in tangy hibiscus glaze, crispy meringue with chia seeds and quinoa, micro basil, and popped quinoa. Lance describes it as “something very light for the meal that you've had. You don’t want too heavy a dessert afterwards, especially when you’re enjoying these great wines." The 2012 Petite Sirah is another thoughtful pairing. Curt tells us how this differs from The Signature. "We backed the tannins off a little bit and we backed a lot of the oak off. We're letting that blackberry fruit come through from the Petite Sirah, so we thought it would go great with the berries in this dessert. It’s a more tame Petite Sirah, but it is going to be more friendly to a dessert than The Signature would have been, unless we would have gone with chocolate." What was the consensus after such a stellar feast? Bravo! As a thank-you for attending, the guests were sent home with gift bags filled with treats - cookies, bacon caramel corn, and peach and honey cake - along with a menu memento and information on Chef Mecinas' upcoming culinary Mash-Ups with guest chefs and the Bodegas Muga wine dinner at Talavera. Don't miss out on this special Vineyard to Table Winemaker series. 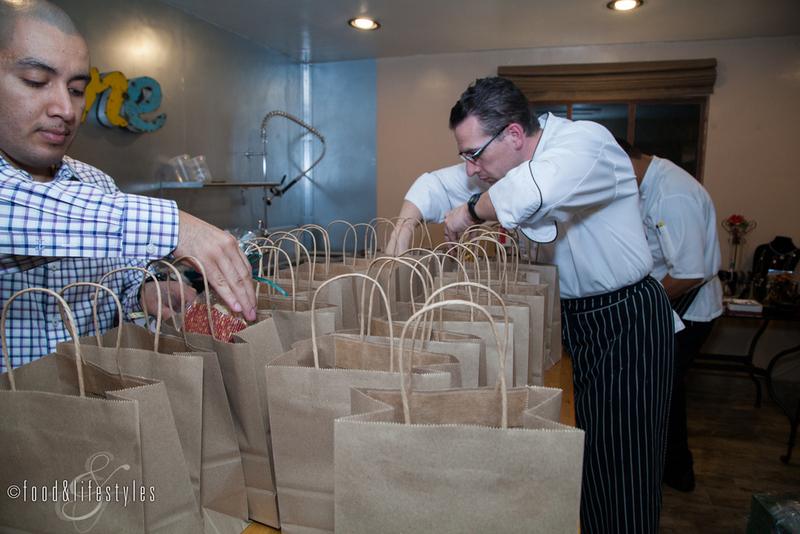 The next dinner takes place on April 11th with Chef Josh Hebert of Posh Restaurant. The delicious-sounding menu and pairings can be found here.